ICAN was delighted to host Ms. Fatima Al Bahadly, Director of Al Firdaws Society, Iraq, and member of the Women’s Alliance for Security Leadership in New York City and Washington, D.C. last month. Al Bahadly’s groundbreaking work in Basra, Iraq focuses on deradicalization, peacebuilding and conflict resolution. For years, Al Bahadly has been demobilizing and reintegrating youth and children who have been recruited by militias, and working with moderate clerics to spread knowledge about the historical role of women and the inclusion of women in public life and leadership roles. On March 20, Al Bahadly spoke at the a policy forum at International Peace Institute (IPI) in NYC that launched Mobilizing Men as Partners for Women, Peace and Security, an initiative seeking to engage global leaders—including prominent men from the defense, diplomacy, development, and business arenas—more fully with the WPS agenda. Ms. Karin Landgren, Executive Director of Security Council Report; Mr. Donald Steinberg, Executive director of Mobilizing Men as Partners for Women, Peace and Security; and Mr. Mirsad “Miki” Jacevic, Vice Chair of the Institute for Inclusive Security joined Al Bahadly on the panel. Ms. Sarah Taylor, IPI Senior Fellow, moderated the discussion. The panel discussion was preceded by opening remarks by Ms. Ana Maria Menéndez, Senior Adviser to the UN Secretary-General on Policy, and Mr. Anwarul K. Chowdhury, former UN Undersecretary-General and High Representative. 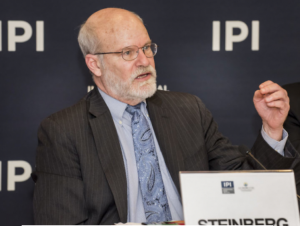 IPI Vice President, Mr. Adam Lupel, welcomed participants by reiterating the notion that the best predictor of a country’s peacefulness is how well its women are treated. “Women’s leadership is critical, and this work very much includes men as allies, as partners, and as self-aware and proactive advocates,” he said. “Feminism is a smart policy which is inclusive, uses all potential, and leaves no one behind,” stated Chowdhury. “For the initiative being launched, all of us should take the vow to profess, advocate, work to ensure feminism as our creed and as our mission,” he added. Jacevic discussed his work on National Action Plans (NAP), which today amount to 81 world-wide. The key to successful NAPs, Jacevic said, is bringing people from various sectors—including women-led civil society—together in a room to decide on priorities and what peace should look like. 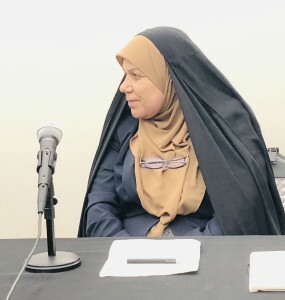 Al Bahadly expounded the context of Iraq and the current situation in her country, then she shared how in 2015 she initiated a dialogue between tribal leaders after a tribal conflict resulted in the kidnapping of 15 women. Using religious approaches, tribal traditions that honor women, and stories from the history of Islam about women’s inclusion in public life and their leadership roles in society, Al Bahadly was able to convince the men to work with her. “We had allies in moderate religious leaders who pressured the heads of tribes to end violations of women.” She also shared her work with former Daesh fighters, stressing the importance of providing adequate support in order to prevent the cycle of violence. 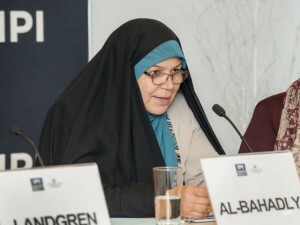 Recognizing the sensitivity of the fact that violence and the use of weapons are often acts perpetrated by men, Al Bahadly said that she believes it to be crucial to involve men in promoting peace. “Changing men’s perceptions through various activities and over long periods of time is of critical importance because we need men who are convinced and have the desire to actively promote the peace agenda,” she added. 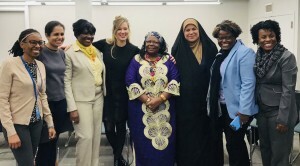 On March 13, Al Bahadly joined ICAN, the Kroc Institute for Peace and Justice (Kroc IPJ), and its Women Waging Peace partners Ms. Stella Sabiti and Ms. Mariam Yazdani to share her story at a discussion entitled Exploring: How Do We Build More Gender Inclusive and Effective Peace Processes. Sabiti, Founder of the Center for Conflict Resolution discussed her work in Uganda, Yazdani, Senior Advisor at Viva Rio shared her experiences from Haiti and Al Bahadly spoke about her work in Iraq. The conversation explored how the three women had gone about negotiating peace in their various contexts, what brought them to that work, and challenges as well as successes. Perhaps the most striking thread between their stories, which focused on Haiti, Iraq, and Uganda, was the importance of not forgetting the humanity behind every person, even those who commit terrible acts of violence. Southern Iraq, where Al Bahadly is based, has long been an epicenter for tribal conflicts and the battle ground for various political parties and radical Islamist groups. With the collapse of security, the control of armed organizations, and expansion of tribal power and extremist parties, the problems have intensified. Simultaneously, the need to address them in a structured and analytic way have also become evident. The issues range from the recruitment of child soldiers, illegal arms sales, and the persecution of women. Women are often marginalized, denied access to education, married off at an early age, and unable to participate in politics. Early on, Al Firdaws Society started working to protect women and girls affected by war, strengthen their role in peacebuilding, and raise awareness about violence against women. Fatima Al Bahadly speaking at Exploring: How Do We Build More Gender Inclusive and Effective Peace Processes.